Do you make PowerPoint presentations that require you to explain a process or procedure frequently? Then in this article, you’ll find some interesting ideas you can implement in your next process presentation. Explaining a process or procedure is very different from explaining any other type of information to the audience. Your end goal of the presentation is not just to make your audience ‘be aware’ of the process, but also to reliably ‘follow’ the process to achieve a desired end result. For that, you need to understand where they are right now, and take them to where they need to be in small incremental steps. As a presenter, you don’t just need knowledge, but also you need empathy. Most presenters make the mistake of picking text right from a process manual and slapping them onto their PowerPoint slides as bullet points, and talk endlessly about each step of the process. It is a sure fire way to bore your audience to tears. If you truly want your audience to understand a process at a deeper and more practical level, you need to go beyond just talking about the process. Nothing beats the experience of ‘being where it all happens’. Take your audience on a field trip to the shop floor where the procedure is implemented. This allows them to see, hear, smell and feel the ‘reality’ than just imagine the process based on your explanation. If you want your audience to have an immersive experience, let them work parts of the process under your supervision (depends on the type of industry you’re in – of course). But, unfortunately a ‘field trip’ is not always practical for everyone. If you can’t take your audience to the action, the next best thing you can do is to bring the action to them. You can show video clips and photos of each step of the process – while you narrate the procedure to them. It is said that, “A picture is worth a thousand words”. Your training presentations would go to the next level when you include relevant video clips and photos on your slides. Don’t wait for professional videographers to perform a 10 day video shoot on the shop floor, to pick the video clips to include in your training presentation. You’d end up postponing the shooting – purely due to inertia, if not anything else. It also costs time and money to get those kind of videos taken. A better alternative would be to shoot the videos yourself. The idea here is to keep it ‘real’. These days you have top quality cameras and audio recorders built right inside your cell phone. So, shoot videos with your cell phone (of course with permission) to include in your training presentations. This is better than relying on professional videographers to do the shooting because, most often they don’t know what to take the video or picture of. You are the expert. So, you know what to show your participants when you teach them. So, it makes a lot of sense for you to take the photos or videos yourself. While you are at it, take a few videos of the staff explaining the different steps in the process, the issues they face and how they solve them etc. Your content will be more relatable to your audience and your presentation transforms into an engaging story. No amount of explanation in your manuals would be able to capture the reality so clearly as a few photos and videos you shoot with your mobile phone. If you can’t take your audience on a field trip or show them videos and photos of the process, you may use clear and simple diagrams on your slides to explain each step of the process. However, I would only use it as a last resort. At least, it is much better than those mind numbing bullet point slides. Realize that the quality of your explanation and the depth of understanding by your audience depends entirely on the extent of effort you’re willing to put in. Never skimp on the effort if you want to get meaningful results from your training presentations. 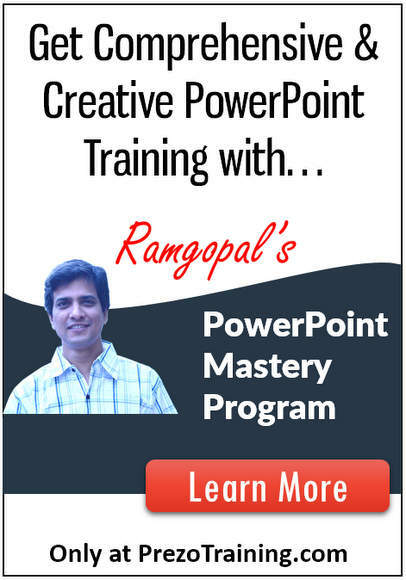 If you are interested in taking your average training presentations to excellent presentations, I highly recommend you take a look at our Ramgopal’s PowerPoint Mastery program. It is the most comprehensive and creative PowerPoint training online for business presenters. I even teach you how to trigger custom animation based on the video bookmarks, so you can have captions appear on your slides at pre-decided points in your videos. Ramgopal’s PowerPoint Mastery Program is the only PowerPoint training program you need to create professional looking slides that get the results you want. The process diagrams showcased above are taught in the 2D and 3D Graphics section of the training program. Why don’t you check out the program by clicking on the link below?